Description: Complete engine cover kits for the Gulfstream G200. This kit includes inlet covers and exhaust covers. 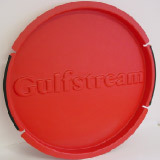 Description: Engine inlet covers for the Gulfstream G200. Description: Engine exhaust covers for the Gulfstream G200. 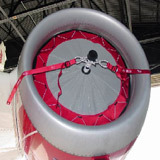 The Gulfstream 200 jet engine exhaust covers have been revised.The exhaust cover set P/N PW306AXGX now includes a brace kit which is now installed on new units in order to improve the exhaust plug function and to keep them in place. If you have an older version of the exhaust cover for your Gulfstream 200 Galaxy and the exhaust cover is in good condition, we do provide exhaust cover upgrades. The part number for the brace is PW306A-XG20B. We recommend replacing cracked exhaust covers with new ones.